New Delhi, November 19, 2018. 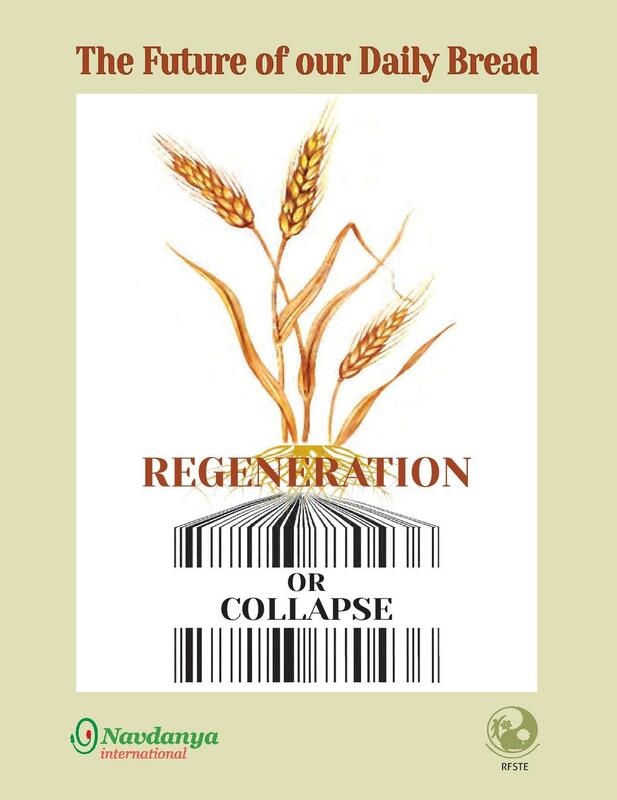 Dr. Vandana Shiva presents in the report The Future of Our Daily Bread: Regeneration or Collapse new evidence on the imminent collapse of our food systems – ecologically, socially and financially if we continue on the path of industrial agriculture based on chemicals, monocultures and corporate control of food and farming. At the ecological level, industrial agriculture based on chemicals and GMOs has contributed to 75% destruction of the soil, water, biodiversity and 50% of green house gases leading to Climate Change, while only contributing to 20% of the food we eat. Regenerative organic farming takes the excess carbon dioxide from the atmosphere where the pollution is destabilizing climate systems, and puts it into the soil through plants, enriching the soil and preparing the broken carbon cycle. Small farmers produce 80% of the food according to the FAO while they regenerate soil, seed, biodiversity and water. The ecologically and socially non-sustainable model of Industrial agriculture is destroying their lives and livelihoods by driving them into debt and suicide. False narratives on feeding the world have been the misleading sign posts that have brought us to the precipice. First they said chemicals will feed us. Then they said GMOs will feed us. The people and planet were left poisoned. Now we are being told ‘Big Data’ will feed us. Industrial agriculture is now being financialised and digitalized creating new risks and vulnerabilities. Hyper concentration of corporate power and convergence of technologies of digitalization, financialisation, commodification for total control of food and farming is the next step of the drive for profits. The lab of financialisation and digitalization of agriculture is India, where the corporate camel is putting its nose in the Andhra Pradesh tent. Bill Gates is shaping the seed and knowledge policy, Walmart is shaping the commodity marketing policy and BNPParibas/BlackRock are orchestrating the financialisation policy. The instability and collapse of the social and ecological systems by a corporate controlled food system are rooted in an extractive economy which has created an inverted pyramid of power which in itself is unstable and can collapse with the smallest trigger. New GMOs based on gene editing and patenting of DNA sequences are being promoted on grounds of “precision” despite the fact that the science shows the uncertainty and imprecision in the new GMO technology. The European Court of Justice has ruled that the new GMOs are GMO’s and need to be regulated for biosafety and impact. The agrichemical industry- the Poison Cartel – which controls seeds and GMOs, has become more concentrated with Bayer merging with Monsanto, Syngenta merging with ChemChina & Dow merging with Dupont. This concentration, combined with false claims of certainty and safety, create vulnerable systems. The cancer epidemic has spread worldwide and it took one cancer case related to Monsanto’s Roundup/Glyphosate, for Bayer, who had acquired Monsanto, to start losing $57 billion of its market value. The seed /chemical giants which imposed a toxic agriculture on the world, including India, are themselves being controlled by the new financial giants such as Vanguard and BlackRock. In Oct 2018 Backrock lost 30% of its value. The transition from Corporate Control of the food system, which is leading to collapse, is not just a possibility. It has become a necessity if we have to avoid collapse at a social, ecological and financial level. A transition to agroecology has become a survival imperative to regenerate the planet and farmers livelihoods and create resilient food systems based on real wealth, not the speculative, fictitious finance of Big Money. For the last 30 years Navdanya has created biodiversity based agro-ecological systems that are sustainable, resilient and fair. We have shown we can feed two India’s by conserving our biodiversity and regenerating our soil, we have shown that farmers creating circular, swadeshi local economies can earn 10 times more than the farmers trapped in extractive economy of exploitation by corporations. During Gandhi’s 150th birth anniversary let us build on his vision of “ever expanding, never ascending oceanic circle” of one humanity, one planet, rich in diversity and self organization. “In this structure composed of innumerable villages, there will be ever widening, never ascending circles. Life will not be a pyramid with the apex sustained by the bottom…till at last the whole becomes one life composed of individuals, never aggressive in their arrogance but ever humble, sharing the majesty of the oceanic circle of which they are integral units. 3 Comments to "Our Food Systems are collapsing Ecologically, Socially and Financially: The Alternative of Agroecology has become a Survival Imperative"
More power to you Ms Vandana Shiva . Totally support Organic and Natural Farming .